Maggie Williams, Sophomore Biology Major, is currently studying abroad at SNU’s Quetzal Education and Research Center (QERC) along with 10 other Nazarene University Students. The group has been in Costa Rica since January 4th. Maggie shared some stories from their time spent learning Spanish and about the culture of Costa Rica. “This past week was full of laughter, awkward moments and a lot of mispronounced words. 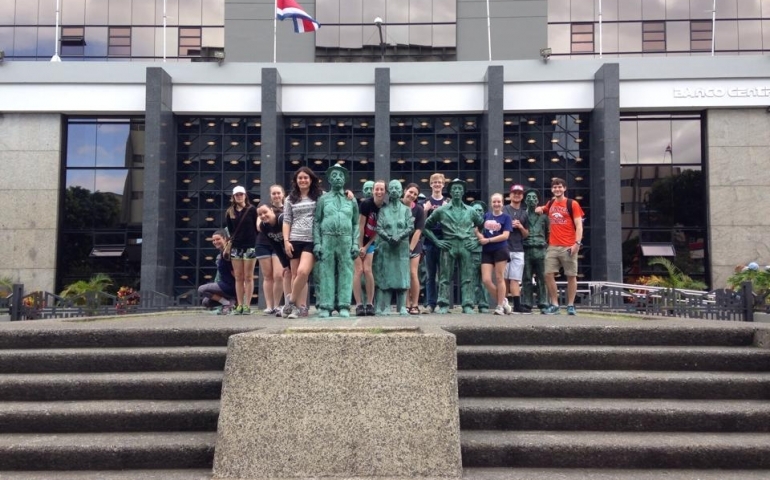 Over the weekend we had a scavenger hunt in San Jose, the capital city of Costa Rica, and I was sure that there was no way that we would be able to get close to finishing it. However, I realized that as long as we could say “Donde esta…” and could understand at least every five words of the directions, then we would only have to ask a couple more people along the way until we found our destination! (I’m probably making that sound harder than it really was.) I was pleasantly surprised by how well our little Spanish got us around the city. (Thanks Dr. Johnson!) A few of the tasks included exchanging money at the bank, finding museums and parks, bartering at the Artesian Market (which I was really terrible at), and my personal favorite, buying ice cream at a shop called POPS. Maggie Williams with her host family. At one point I heard “Maggie!” being shouted from a bus on the street. I thought to myself, ‘Who knows me here?” It turned out to be one of our friends that we played soccer in the valley, San Gerardo De Dota where the QERC campus is located, with two nights before. He told us to call him John Rambo because it was the “whitest name” he could think of. After our eventful weekend, we returned to San Gerardo de Dota to spend our week with host families. It was very intimidating to walk into my new home knowing that I could barely speak their language. Who knew that I would have to think so hard about talking? It usually comes pretty natural to me! I had so much fun with my Costa Rican family, and I wish that I could share everything about my time with them, but I will try to keep it to the highlights. My family consists of two parents, Genri and Marjorie, two sisters, Fernanda (15 years old) and Melany (8 years old), and a visiting grandma with her 9 year old son, Fau. I was seriously impressed that they would be willing to let a complete stranger stay in their 2 bedroom house when they already have 2 other visitors! Talk about hospitality. I shared a twin bed with Fernanda, and Melany sleeps on the other bed in our room. The first night was kind of awkward. After the first hour of telling them a little bit about myself and meeting them, us girls went to our bedroom and watched TV. Who knew that I would bond with both my sisters in Oklahoma and in Costa Rica over the shoHow I Met Your Mother? I’m sure my dad is cringing while reading this since the show is banned in our house. The food was really good and always consists of rice and beans. One night I was served trout. It was delicious and fresh! I was kind of surprised to look down at my plate and see half of a fish with the tail still attached. I carefully picked around the spine and enjoyed it, all the while trying not to watch Melany poke the eye of the fish that was on her plate. I talked the most to Melany and Fernanda because they speak slowly enough for me to understand, and they are good at explaining words that I don’t understand. Melany and I played escuelita (little school) and made crafts together. My favorite gift that she has given me is a list of 30 facts about herself. I was telling her how to say things in English while she patiently corrected my Spanish. One time, while I was teaching Melany how to count in English, she accidentally pronounced 11 as elephant. We got a good kick out of that. Like the QERC facebook page for more updates, and stay tuned for more updates on Students Studying Abroad the Spring.